Everyone has a pair of pliers somewhere in their home. As one of the most useful tools out there, it might surprise you at just how many different types there are and how versatile pliers can be. There are only a few parts to pliers, but all of them have an important function. In a few cases, the parts may vary to complete a specific function. Cutters – These surfaces are generally located close to the fulcrum and are used for cutting wire and cables. Fulcrum (or Pivot Point) – Not only is this the place where the handles and jaws connect, it also serves to create enough force for the jaws to perform their duty. Handles – The part you hold. These can be straight or curved, and the surface will wither be bare metal or plastic coated. Jaws (or Nose) – The working end of pliers are used primarily for gripping. Combination pliers have jaws which also contain cutters and/or pipe grips. Pipe Grips – A rounded opening in the jaws, pipe grips are designed to do what the name implies, and are very useful for gripping round objects. Chances are, you have seen or used these pliers at some point in your lifetime. They are available almost anywhere and in many cases can be used for other purposes in a pinch. These pliers have the fulcrum at the far end and are used similarly to a nutcracker. Wires are fed into the jack of the jaw first, then the connector. Squeezing the handles will break through the plastic coating and cause the two sections to deform (or crimp) in such a way that they stick together and allow data to pass through. 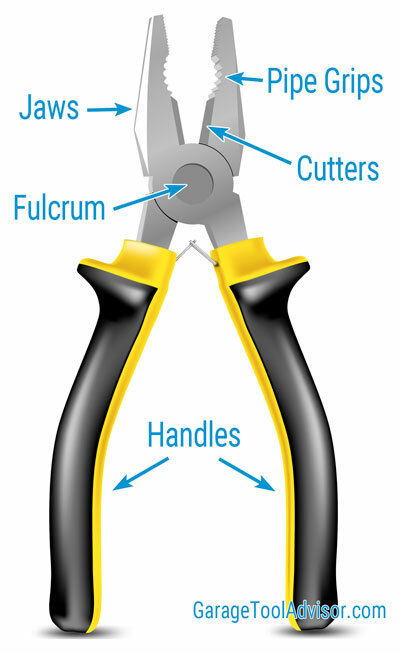 Crimping pliers are used heavily in networking and telecommunications. The jaws of these pliers have an angled edge designed to cut through thick wire. They are quite strong and can also be used to cut nails. Thus they are useful in carpentry as well as electrical work. These pliers are designed to compress hose and spring clamps, making the connection tighter. As a result, they come in a wide range of designs. The most common models have a peg-shaped tooth on each jaw, which is used to pinch the clamp. Some models may also be used directly on the hose. The nose of this tool is elongated for more precision and contains a cutting edge near the base. A highly versatile tool, it can be used for bending, shaping, and cutting wire. These pliers are employed by a wide range of trades, including: armouring, electrical, fishing, jewelry making, and network engineering. Most home toolkits will have at least one of these. Closely related to the adjustable wrench, these pliers have an adjustable fulcrum to alter the width of the jaws. Many variants have notches for the fulcrum’s bolt to slip into when the jaws are open, letting you lock on a specific width. They are often used for plumbing applications and can perform many of the same duties as wrenches. These pliers have short, round jaws to aid in closing snap rings. These rings are open-ended loops that fit into grooves of a dowel or other round object. Once closed, the ring can rotate freely, but is unable to slide sideways.They are commonly used for the gears on mountain bikes and similar vehicles. These are an adjustable type of pliers with a toothed groove along the upper handle, allowing the lower jaw to be locked into a number of positions. The angled jaws make this tool useful for turning nuts and bolts. The popular company Channellock officially changed its name to match this tool in 1963, which has been their most famous product line since the name was trademarked by the company in 1949. While the previous pliers are all commonly found in tool kits, there are a number of more specialized pliers that you may never encounter outside of their relat4ed trades. The jaws of this tool consist of two dowels, one larger than the other. Used primarily in jewelry making, wire is wrapped around the jaws to form clasps, ear wires, and a number of other shaped loop components. Used primarily in the automotive industry for maintaining the bolts on car batteries and jumper cables, these pliers have short, angled jaws. The lower jaw is slightly smaller, and both jaws are thick to make them more durable. This variation of needle nose pliers has a set of jaws that are bent at an angle at the midpoint (most commonly 45 or 90 degrees). This allows them to grip surfaces without getting in the way when multiple pliers are needed or the angle is too difficult to reach with normal needle nose pliers. As a result, they are useful in jewelry making, electrical work, and other occupations which deal with shaping wire. Another useful automotive tool, these pliers are actually a multi-tool designed specifically for handling the springs found in drum brakes. One jaw tip is rounded for removing springs, while the other is curved to put springs back in. Sometimes, one of the handles also has a ratchet to remove the shoe hold-down pin. An invaluable tool for artists, these wide-jawed pliers allow one person to do what normally takes two. The jaws are usually padded to avoid damaging the canvas surface while it’s being stretched onto the frame. Featuring stubby triangular jaws, chain nose pliers are one of the many tools used in wire shaping and jewelry making. The jaw design allows for bending, crimping, and shaping wire. When working with beads, the tip aids in closing or opening bead tips and jump rings. These multipurpose tools have three separate sections in the jaws. From the tip, the first part is a serrated gripping surface. A round serrated section behind this makes gripping tubes and other thick round objects easier. Finally, the section closest to the fulcrum contains a cutting surface. Often mistaken for linesman pliers, the latter lacks a rounded center section in the jaws. An important component in tailoring, cobbling, and other clothing industries, eyelets allow laces and drawstrings to be added to clothes. These eyelets have a ring and elongated hub which must be crimped down. Most modern eyelet pliers have interchangeable dies to allow for both hole punching and crimping, although some have only crimping surfaces or a wheel in the upper jaw containing various die tips. This curious-looking multi-tool resembles a hammer with two handles when looked at from above. Notches in the fulcrum allow you to cut wires of different gauges, while the side of the left jaw has a hammer surface for driving in staples. The claw of the right jaw can be used for removing staples, and the jaws themselves contain a gripping surface and a rounded grip hole. The flat, tapered jaws of these pliers are used for gripping and twisting metal, as well as twisting leads and wires. It’s a common tool in both electrical and mechanical work. They can easily make sharp bends and right angles with wire and also work well for straightening. Available with short or long noses. Similar in form and function to eyelet pliers, grommet pliers are used to create holes in tarp and other materials, as well as affixing grommets. Grommets are more heavy-duty than eyelets, making this tool perfect for crafts involving sturdy materials such as tent-making. These specialty pliers are designed to easily get small hoses into or out of tight places. Their grabber jaws are shaped in a way to prevent damage to hoses such as vacuum lines, heater hoses, and fuel lines. Simply grip and twist the hose on or off. Hose grip pliers also work great for clamps, spark plugs, and other various small components. While the name might not seem familiar, chances are you’ve seen or used these at some point. Easily identified by the jaws, which have a shorter gripping surface towards the tip and a cutting surface in the middle, this is a highly versatile tool used most often in electrical work. Due to the multi-tool function and strength of the jaws, this too can be used to bend, twist, and curt metal that might be too tough for other pliers. In some cases, the insulated handles are capable of protecting the user from electrical shocks, although most models are not rated against shock. As the name implies, the jaws of these pliers are designed to lock in place, making them excellent for gripping stripped screws and bolts. A wide variety of jaw shapes are available for this tool, allowing you to choose a design that best fits your needs. Similar in appearance to tongs, the tips of its caws are tapered to allow it to dig under the head of nails and pull them out. Some variations also have a claw on the back of the right jaw to provide additional leverage. These odd looking pliers have a C-shaped pair of toothed jaws, with one being much longer than the other. They’re used in the automotive industry to remove oil filter casings. There are two major design of piston ring pliers, both of which are used to remove and replace piston rings in engines. The first has simple curved tips on the jaws that can be used to spread a piston ring for easy removal. The second has a much larger curved set of jaws with several braces to support the ring and reduce the risk of warping. The jaw tips of these pliers are wedge-shaped to allow them to get under the pin cap of plastic anchors. By squeezing the pliers, the push pin will pop out, allowing for the safe removal of anchors. This tool is used in automotive work, as well as other industries where push pin-style anchors are used. Not to be confused with the similar bail making pliers, the rounded jaws on these pliers are slightly tapered and come together to form a triangular jaw design. They are used to create loops in jewelry, especially rosaries and similar projects. Some also have insulated handles for use in electrical work. 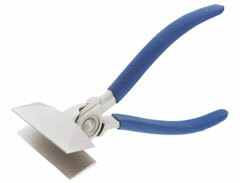 Used in creating stained glass crafts, these pliers make a clean break along scored lines in the glass. The wide-tipped jaws can be adjusted to match the thickness of your glass and most have a center line to ensure proper alignment when running along the score. The wide, rectangular jaws of these pliers are used for bending sheet metal and forming seams. They are commonly found in metal shops and other industries where sheet metal is used. These are sometimes a version of locking pliers specifically designed for metal work. Resembling a stubby version of needle nose or chain nose pliers, split ring pliers have a hooked tip on the lower jaw. This tip acts as a wedge, splitting coiled rings apart. Split rings are commonly used in the creation of fishing tackles and keyrings. Used for plumbing and scuba diving equipment, soft jaw pliers can include variations of many common types of pliers. The difference is that these pliers have padded jaws to prevent scratches on chrome and other soft metals or exposed surfaces. The narrow jaws of these pliers are tipped with either insulated tongs or a cylindrical holder. As the name suggests, the tips grip spark plugs by the boot or plug wires, aiding in automotive repairs. The jaws of welding pliers azre similar to those of combination pliers, with the same tip as the jaws of needle nose pliers. This tool performs a number of functions, including spatter removal, gripping wire, cutting, and even hammering. As the name implies, these pliers are used heavily in welding-based trades. This unusual tool has short jaws with a cutting edge by the fulcrum. Between the handles is a cylindrical locking mechanism and threaded knob. By locking a piece of wire into the jaws and pulling back on the knob, the entire tool spins, twisting the wire along with it. Most commonly used in jewelry making, these pliers are also frequently used by electricians. Go ahead and send the pic to chris(at)garagetooladvisor.com and I’ll do my best to help out. What about flat nose expanding/spreading pliers like these? Very useful for prying things apart without the risk of damage screwdrivers can cause. They are especially helpful when separating pieces that are glued together, e.g. removing a headlight cover from its housing.